On February 2, 2015 Aspens & Oaks, while continuing in its effort to reach more people in the community, is offering Family Practice Services for the first time. CLICK on LOGO below to go to A&O Medical Services NEW Website!!! 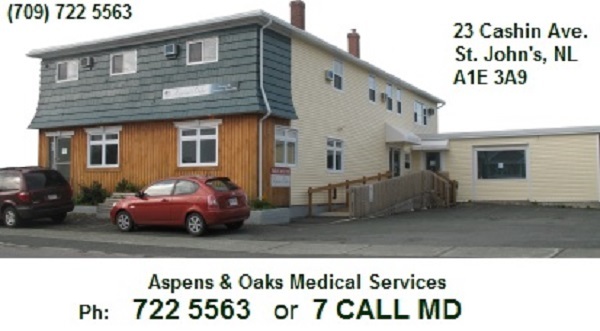 It has becomie ever more difficult to find a family doctor in NL and the St. John’s metro area and for this reason we have started the Medical Services division of Aspens & Oaks. You have trusted A&O to meet your mental health needs and via our Counselling Services & Solutions division for over 23 years, and we will apply our same standards of service and confidentiality to our Medical Services offering. For your convenience we have secured a phone number which should be easy to remember when you need to see a doctor… it is 722-5563 or 7 CALL MD. Additionally, A & O Medical Services has its own website in order to give you even greater access to your doctor (online appointment requests) and other important information. NOTE: WALK-IN service DISCONTINUED while we are searching for New Physicians.